Derrick is a trial lawyer who focuses on complex business disputes. He has significant experience as lead trial counsel in a variety of litigation matters, including partnership disputes, real estate litigation, employment litigation, intellectual property disputes, trust and fiduciary litigation, injunctive relief and sports and entertainment-related disputes. In addition, he has been retained as appellate counsel in cases involving business and contract disputes. 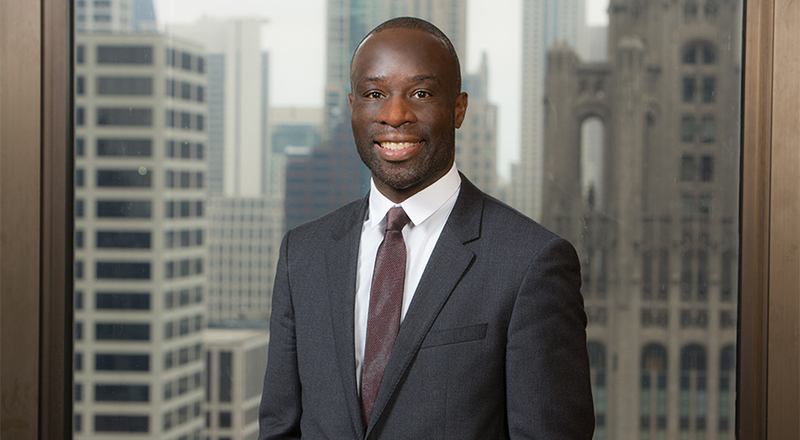 Derrick also represents individuals and businesses in contract negotiations and counsels corporations, not-for-profit entities, religious organizations and sports and entertainment-related companies. Derrick has an extensive background in sports. His experience includes playing college football for Northwestern University in the late '90s and representing professional athletes as a National Football League contract advisor. Derrick’s experience gives him a unique perspective in helping sports and entertainment-related companies resolve their legal disputes. Derrick has been recognized as an “Emerging Lawyer” by Leading Lawyers Network, an honor reserved for lawyers who are 40 years or younger and have proven themselves to be professional, ethical and experienced at an early point in their legal careers. This distinction has been earned by fewer than two percent of all lawyers licensed to practice in Illinois. Represented over 100 direct lenders and bankruptcy receiver at trial in a case involving mortgages and various mechanics’ liens, the major issue being the release (or non-release) of $25 million lien - resulted in trial court constructing mortgages and related contracts in favor of the direct lenders and judgment in favor of direct lenders at trial (Successfully, defended appeal). Represented beneficiaries in action against trustee for trustee/agent’s failure to timely file tax returns resulting in over $2.5 million in penalties, breach of fiduciary duty, breach of duty of care and professional negligence. Matter resolved with trustee and its insurer consenting to million dollar settlement, trustee removal, and IRS rulings in favor of the beneficiaries. Represented not-for-profit childcare facility in declaratory judgment action against national insurance company - obtaining full coverage for facility and arbitration award in favor of childcare facility. Represented religious organization in declaratory action against national insurance company - obtaining million dollar coverage determination in favor of organization. Represented entertainment company in breach of contract and warranty suit against municipality and various vendors - obtaining favorable settlement for company. Defended a prominent Chicago family against breach of contract and failure to disclose allegations in a large real estate transaction - resulting in not guilty at trial. Represented family in action against trustee for accounting, breach of fiduciary duty and negligence - resulting in removal of trustee and damage award in favor of family.